These days, I feel like I'm busy when things are happening in fandom. I was away all weekend returned home tired and falling asleep the moment I sit down. Anyway, I LOVE this logo! Simple looking but somewhat complicated and I'm sure, very meaningful. No kawaii crap. No cutesy name. Just simply back and white that pretty much screams KAT-TUN <3 I'm loving this re-UNION! Somewhere along the way, I stopped making birthday posts ><"
But that's slowly changing. I need new icons! And I think it's deliberate that the logo is like the three of them joining their hand together. You know, like to cheer themselves on. and hey you! Welcome back? I can't wait to get busy around here again! It took time, but I finally understood how I feel now about him... Well, I'm in the middle. I still love his voice and his joyful personality but I do not mind at all dissing him and his doubtful song choices. I mean, seriously, on his latest album I really liked three songs only (one especially being an acoustic version without all this c*** of sounds he adds in other songs, it was just his voice and an instrument.) Seriously, "this one" gives me shivers everytime I listen to it. PS1: It was Graduations, Crimson and On the moon (acoustic version) if you"re curious about them. PS2: Basically, you got a sample of how I feel about him in my comment. As you can see, it is just as I said. ^.^ So far, I think I'll only buy an album of Junno if it is a FULL acoustic album. Btw, you need a new image for your "semi-friends" post now. I'm waiting on itz_menos to hook me up with some 3nin goodies! Yeah, he has too many unnecessary auto tunes. I think he's still experimenting because he's all over the place genre-wise. I never do miss him as much until I see a pic of him smiling and that just sends back all the feels. But yeah, it's really hard getting over these idols we invest so much time and energy in. These days, I want to invest in Uepi. You can try Uepi/Shige. He's a big fan of his books, normally. They talked about it together. JunDa is still my main people. But yeah Shige or even Koyama are chat with Uepi. I'm more Ryo/Shige when Ryo was still around NEWS. But I meant invest in Tatsuya as an individual. I wish he could get even more exposure that he's getting now. Well, he only needs to play THE character in a drama, just like Junno as Ranmaru in Legal High. His popularity skyrocketed thanks to this character. Even if Tatsuya's latests roles were really good, I don't feel like they made such an impression (compared to Ranmaru with Junno) to the fans. oh yeah, Shinjuku 007 was really good. Too bad it was only shown in some cities and very late at night so it wasn't good for exposure. He really needs that big break... a role with a well known actor! I also love this Logo!! As you say it's simple, no cutesy stuff. And full of meaning, I'm sure. And it's always inetresting seeing people specualte. 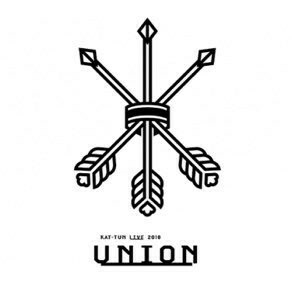 Someone pointed out that the middle part that holds the arrows together seems like an hyphen, which I love the idea^^. Someone else pointed that there's three arrows but six "ends", which I also like. And other thoughts lolol. And imagine the goods with this logo ^^ LOVE, lots and lots of LOVE!! Gaaaahhhhhh the photobook.... *cuddles it* I don't want to go Smeagol on this but... It's a very very nice collection of photos! Hope you have yours already! Really, the book was sold out? Aww, but I'm sure you'll find a place that still has it. Have you tried AmazonJP? Damn. I forgot about amazon and ordered it on cdjapan which is more expensive because they charged extra for sourcing a second pre-order. So I'm trying to get it cancelled so I can buy it off amazon who will also waive the shipping fee so I'll basically just pay for the photobook. now Idk if I want to go. The fan event, I know nothing, lol! I received the notification checked the date and since I couldn't attend it, I preferred not know more, so that I wouldn't feel frustrated lololol. "I'm still living in the era of scraping for info so it's still unbelievable that johnnys idols can now use their proper pictures on TV etc and now there's a youtube channel." I managed to cancel cdjapan and ordered from Amazon! IDK what this fan event is about which is scary. I'll apply but even if I get a poss, I might not go unless I know more. "IDK what this fan event is about which is scary."